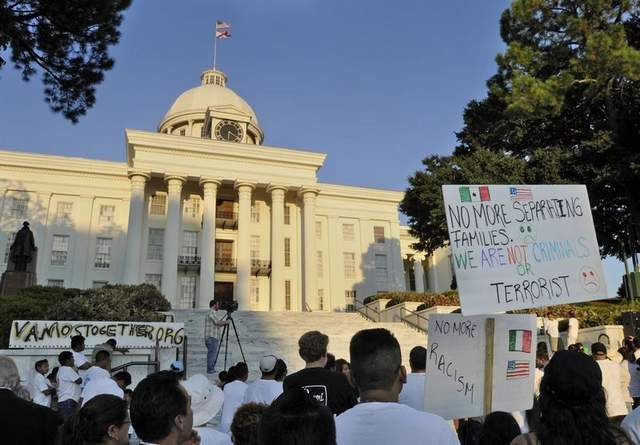 MONTGOMERY, AL - A U.S. federal judge has temporarily blocked a controversial immigration law that was set to go into effect Thursday in the southern U.S. state of Alabama. The law would allow Alabama police to detain anyone suspected of being in the country illegally when that person is stopped for any other reason. It would also make it a crime to knowingly transport or harbor an illegal immigrant, and compel public schools to verify the immigration status of students. Last month, a coalition of civil rights groups filed a class action lawsuit against the measure, saying it invites racial profiling and will target for harassment anyone who looks "foreign." In her two-page order, U.S. Judge Sharon Lovelace Blackburn said there was not enough time before Thursday to address all the legal arguments from various parties over the law's constitutionality. "It is hereby ordered that Act 2011-535 is temporarily enjoined, and may not be executed or enforced," wrote Blackburn.